Just back from a wonderful 16 days in Uganda, with one highlight was getting to spend time with Mountain Gorillas again. This is "Nsekuye" a 2 yr old male infant, granting me this wonderful over the shoulder pose, he's one of 8 that form the Nyakagezi family, which boasts 3 Silverbacks. 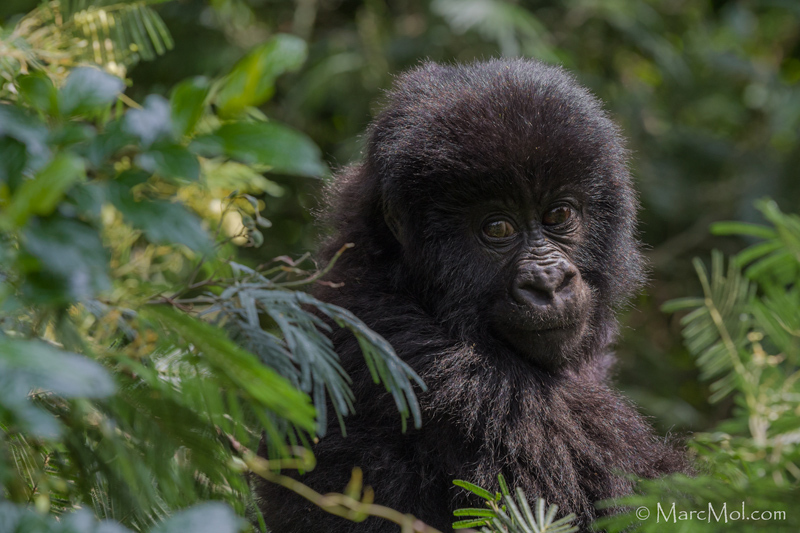 A fantastic portrait of this young gorilla, Marc. The eyes say it all. Caught the essence of this young fella Marc. Nicely done. Looking forward to seeing more! Such captivating creatures with their wonderfully poignant expressions, Marc. You have indeed allowed us to glimpse a momentary view into the soul of this infant, as I feel he must have when his eyes met yours. A beautifully sensitive portrait. Just captivating, peering at you from the bushes. Lovely expression. Such an engaging look... up there with your best Marc.